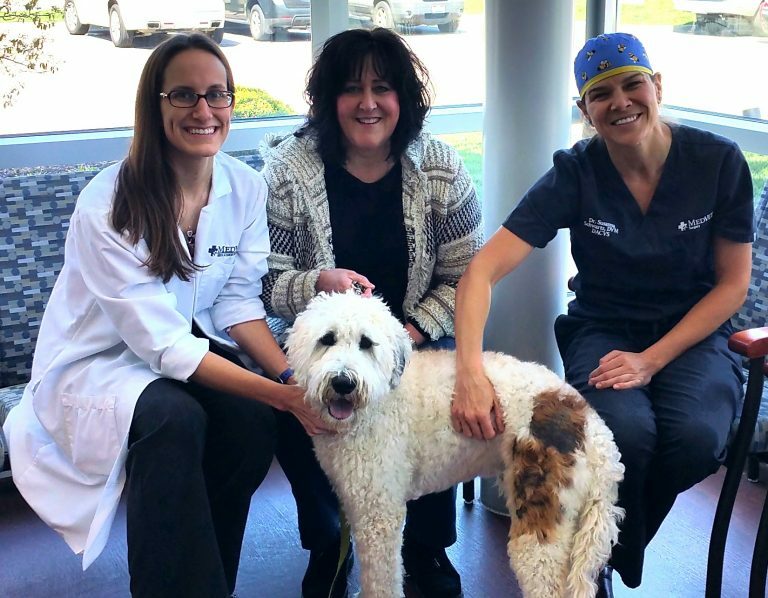 Jackson was referred to the Dermatology service by Dr. Carter in Fall 2015 for skin swelling on his back leg that was worsening despite treatment. Dr. Ashley Detwiler elicited Dr. Suzanna Schwartz’s surgical and wound care experience when it worsened and needed intense management. Dr. Detwiler sent tissue samples to labs around the country and consulted with many colleagues and experts for Jackson’s treatment plan. Jackson was diagnosed with a rare and aggressive skin infection that is typically found in Louisiana or Texas — Cutaneous Pythiosis. He has been receiving daily antifungal therapies for the last 4 months, with additional immunotherapy specific for the infection. Jackson’s recheck on Tuesday was the first time his skin looked healed on the surface in 5-6 months. He has a long road ahead to make sure the infection is resolved in the deep skin and tissue. Jackson is beating the odds and we couldn’t be happier with his response so far! He is so sweet every time we see him and his family has been amazing to trust us with his care!!! And we love the new hair color growing back where the skin is healing!